After the definition let’s look at what practical relevance all this has. For me the most important part is a shift of perspective. The functional view is mainly about the orgchart and who needs to do something, whereas the process-oriented one is about what needs to be done. Hopefully, the picture below illustrates this. The concrete knowledge about interdependencies, what needs to be done where, etc. The above picture shows a pretty generic example, which indicates that most likely there is a set of common processes across various verticals and organizations. And indeed, if you go through various publications you see a pattern even amongst the different classifications. The consensus seems to look like this. An interesting part of looking at processes is the identification of patterns across organizations. After an introduction on where process orientation comes from, we will now move on to the definition. This explains some key characteristics of a process. When I first looked into the subject in 1999/2000 no generally agreed-upon formal definition had emerged yet. I haven’t re-checked on this but suspect that it hasn’t changed much, given that the topic has broadened so much in recent years. In my view the main reason for this seemingly lack of agreement is the sheer multitude of perspectives and backgrounds from which people look at the whole thing. "a collection of activities that takes one or more kinds of input and creates an output that is of value to the customer." Another one is taken from Jörg Becker and Reinhard Schütte (1996) “Handelsinformationssysteme” (=information systems for trade). "A process is a content-wise conclusive and time-wise ordered set of functions that are required to perform work on an object that is relevant to the business." The second example underlines an interesting observation I had made at the time: Folks coming from a computer science background tended to not have the word customer in their definition. Of course this changed quite a bit but I think it’s interesting to see where things have come from. Instead of providing a formal definition I would like to mention a few important aspects that in my view touch upon the key aspects of a process. Within a business the creation of added value happens along the value chain (as first defined by Michael Porter in 1985) which is generally cross-functional. The value chain can be decomposed into transactions which, in turn, can be assembled to processes. That is processes describe activities. Each process has an owner that is responsible and serves as a first contact. 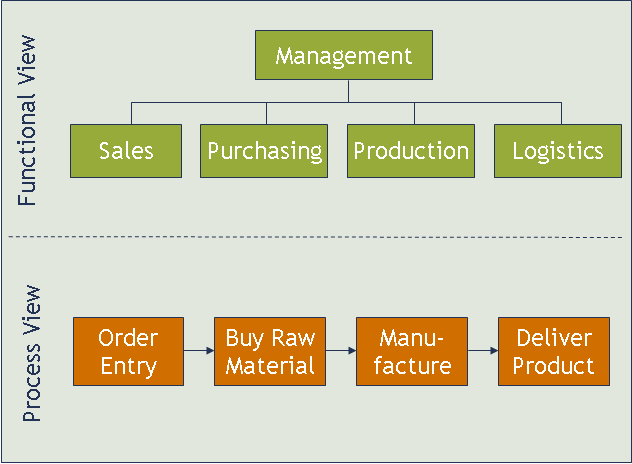 The interfaces between processes, process steps and involved parties are seen as customer-supplier relationships (“the next process is your customer”). Processes are related to objects. They can be material, i.e. physical goods, or informational. Target criteria of processes are time, costs and quality. That has two implications: Firstly that a process has to meet certain targets for all those criteria. And secondly that its current achievement of them is a key aspect to describe it. Now, those are all fairly theoretical points but I think knowing them helps to participate in discussions on the subject. Also, given that all this was compiled about ten years ago, highlights how much the discipline as a whole has progressed. Bear in mind, that at the time the Internet as we know it today, had just started to emerge. Neither Google nor Wikipedia were around, so it was all down to classical research by going to the university library and read books. Not the worst thing, though! I just read Wikipedia’s article on business process and recommend that you do so, too. It provides additional aspects but also lacks at least one of mine (the target criteria part). And finally, here are a few links to relevant books. (If the years differ from references made in the text it is simply because I chose to go for the latest edition here.) I used a whole lot more books, but most of them are in German so I decided to not put them up here. However, if you are interested please indicate so in the comments and I will happily provide more references. Part 3 of this series will compare the functional and process-oriented view and show how to classify processes. This post is the first of a series aimed to give a general overview on processes and how they have affected the way we look at how organizations achieve their goals. The text is somewhat academic in nature but I still encourage you to read it. Understanding the basics and (theoretical) concepts is always helpful when it comes to practically dealing with specific challenges. The process-oriented approach became mainstream in management theory in the 1990s. This was a move away from a mainly functional view that had been the predominant paradigm for many decades. A functional touch can largely still be found when you look at the orgchart: Purchasing, marketing, HR, etc. are all functions and will probably be around for quite some time. But instead of focusing on those functions, nowadays people realize that cooperation across the board is necessary to deliver something useful for the customer. There were a few points that triggered this re-thinking which I would like to mention here. As with so many things, this re-thinking was mostly triggered by difficult economic circumstances. Part 2 will give a definition of what a process actually is.